(Not) Just Another Mom of Twins: What I Love About Me- Week #9! Hint- I WON, I WON, I W-O-N!! What I Love About Me- Week #9! Hint- I WON, I WON, I W-O-N!! My blogger bud, Holly over at Twins Plus One, Three Times the Fun as given me a "Blog On fire" award! And that's what I am LOVIN' about ME today! I am soooo excited that I could PEE MY PANTS! If you've been awarded a bloggy award, you know what I am talking about. For those of you who haven't...it's a pretty darn good feeling!! The rules of the award state that the recipient must list seven things about themselves and then pass the award to 10 other deserving bloggers! I would first like to thank Holly for presenting me with the prestigious, not for the "chilly", Bog On Fire Award! Holly, I so appreciate every time you stop by and leave me a wonderful comment and I absolutely LOVE reading your adventures and am so happy to have "clicked" upon your blog. 1. I always wanted 5 children but I am MORE than happy with just 2! 3. Before becoming a SAHM I had a very successful career working with adults with developmental disabilities. I have supported individuals to live inclusive, meaningful lives since I was 15 years old. 4. I continue to work part time. I am on call 24 hours a day, 365 days of the year for 2 individuals who have developmental disabilities and live independently in their own homes. I support them weekly to clean, grocery shop, pay bills, manage their finances and engage in their community. 5. I love to play Santa! Every Christmas I anonymously support another family who has twins to have a wonderful Christmas. 6. I often daydream of winning the lottery so I can play Santa to more families. 7. My weight on my driver's license is 30 pounds LIGHTER than I actually am...LOL! And now I PROUDLY present the following 10 of my "blogger buds" the Blog On Fire Award...some of you may have just received this award or have in the past, which means you are REALLY on fire!! So, please do not feel obligated to "follow the rules twice" LOL!! Please Be Sure To "Click-On-Over" for a visit...you won't be disappointed...I promise! 1. My first E-V-E-R blogger bud Andrea over at The May Twins is someone I want to say "thanks" to for showing me that sharing stories about IVF makes us stronger. She is worth the "click over"! 2. My new Blogger Bestie, Becca over at Because I'm The Mommy is someone who has been so VERY helpful to me!! She is also, HI-larious! 4. Another one of my "over-seas" blogger buds Marcia at 123 Blog. A great read and she helps me to remember the importance of the 1..2..3's of blogging. 5. I adore Melissa at MaMe Musings who's inspirational stories about travelling and learning to "let go" of structure (sometimes) is inspiring! 6. Twingle Mommy, A.K.A Allison is always a fabulous read and she is a trooper in tips when it comes to "cutting back"!! 8. Liz over at Thriving & Surviving With Twins AND owner of Sweet Simplicity Designs is someone to check out, especially if you are wanting a Blog Makeover! 9. Laura is a "straight-shooter" and full of wit over at Catharsis,I also enjoy her more wholesome (her word NOT mine) Families Coping With Infant Stroke blog! 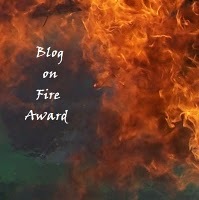 Today, I am LOVIN' that my Blog meant enough to someone for them to give me a super-dooper "hot" award! Come on...Join In and Tell Us What YOU Love About YOU Today!! "The wise know the value of friendship, and that it is wisdom to be a friend to oneself too." -A.C. Grayling Welcome to Week 9 of "What I Love About Me!" hosted by Twins Plus One, Three Times the Fun and Twingle Mommy!